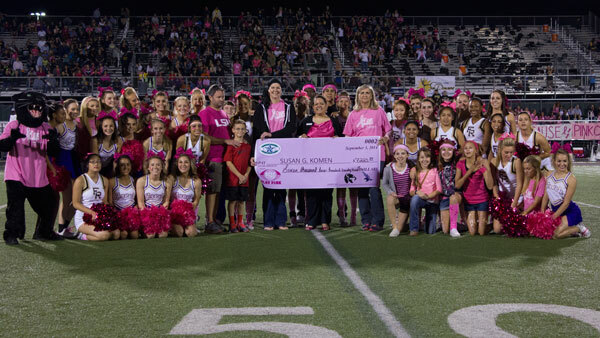 Timber Creek and Fossil Ridge high schools joined together to raise over $7,200 for Susan G. Komen during the “Claws for a Cause” event. (Photo by The Creek yearbook photographer Sabrina Trejo.) Oct. 3, 2014. Despite being opponents in an Oct. 3 varsity football match-up, both Timber Creek and Fossil Ridge high schools in Keller Independent School District came together to raise funds for charity. The combined forces of TCHS and FRHS raised over $7,200 dollars that was presented to the Greater Fort Worth chapter of the Susan G. Komen Foundation during Friday night’s game. Kim Rodriguez, a representative from Susan G. Komen, came to the game on Friday night to receive a ceremonial check for the funds. TCHS Cheerleading head coach Jaime Morgan said Rodriguez commented on how impressed she was with the support for the cause. Morgan said the “Claws for a Cause” event will continue as a tradition for the Timber Creek/Fossil Ridge football game. Next Next post: Need a Verification of Enrollment Form? Read This.